Universal Triple Action takes care of remedial wood treatment and preservation in one can. 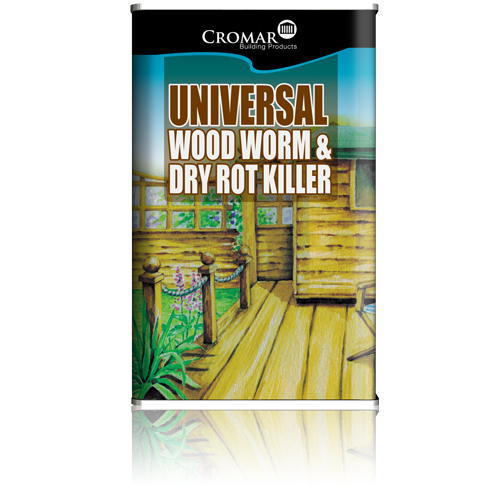 It is specially designed to deeply penetrate all wood and joinery to give lasting protection from damage caused by wet rot, dry rot, fungi and wood boring insects & larvae. Kills - Protects - Preserves: Micro Fine Actives penetrate deep into the wood. READ RISK and HEALTH & SAFETY DATA on the TIN, BEFORE USE. Low Solvent - Low Odour - Low VOC's. E. & O.E. see T&C - We do try to keep prices and specifi­cations of of Cromar Woodworm and Dry-Rot Fluid correct, but mistakes can be made!